Can Demons Possess Inanimate Or Non-Living Objects? Is it possible for Satan or demons to possess inanimate objects like chairs, houses and other non-living objects? Who or what are demons? Demons are angels that fell from grace by choosing to follow Lucifer’s rebellion against God. In wanting to become like God, or really, to be in place of God, Lucifer was corrupted by his beauty and let his pride destroy his reasoning, because how could he ever think he could overtake God!? It’s just not logical. Since that time, Satan, and 1/3rd of the angels have been on mission to destroy anything and anyone having to do with God, however the kingdom of darkness can never overtake the kingdom of Light (John 1:5). Even though Satan and his minions are only bent toward opposing anything about God, including those who would trust in the Son of God, he has been defeated so he can only send fiery darts our way. Thankfully, the Apostle John reminds you that “you are from God and have overcome them, for he who is in you is greater than he who is in the world” (1st John 4:4). These demons cannot overcome the Holy Spirit living in every believer. These demons can sometimes possess people who are still living in darkness. For example, we read of circumstances where the Apostles Peter and Paul cast out demons, but most of the accounts of exorcisms come from Jesus. He cast out more demons than all other people in the New Testament combined. In all of these cases, there is not one example of a demon ever possessing anything other than a living being, even if it was pigs, but never do we see them possessing a believer. On one occasion, the demons were forced to flee into some pigs once as a result of Jesus’ command (Matt 8:28-34), but the pigs didn’t live long and this is not a precedence for believing that demons can possess animals, so this one occasion cannot be used as proof that demons can possess animals. The major point about created beings, even demons, is they are all subject to the commands of Jesus Christ, because the Creator always has power over the created. The Old Testament and the New Testament both mention demons, and interestingly, both mention making sacrifices to them. In the Old Testament, Moses records God speaking about the pagan nations that “They sacrificed to demons that were no gods, to gods they had never known, to new gods that had come recently, whom your fathers had never dreaded” (Deut 32:17), and Judah fell into such pagan idolatry that even Judah’s King Manasseh sacrificed his own children in the fire (2nd Chron 33:6) as the psalmist records; “They sacrificed their sons and their daughters to the demons” (Psalm 106:37), however, even in the New Testament we read where the Apostle Paul writes that when “pagans sacrifice they offer to demons and not to God. I do not want you to be participants with demons” (1st Cor 10:20). These biblical passages suggest that demons are not only real but they can even be worshiped by making sacrifices to them, even humans! I have never seen even one example of a person who was a believer and was possessed in the New Testament. If that were a problem, you would think the Apostles would have addressed it in one of their books in the Bible. Of course, that could be said to be an argument from silence, but to believe that the Spirit of God can succumb to a demon seems beyond impossible. The Holy Spirit lives in every believer and since the Holy Spirit is also God, God cannot be displaced by a being that He created. The images we see where Jesus is arm wrestling with Satan is misleading because the Devil has been defeated at the cross (John 12:31, 14:30). It was no contest! Yes, he can still harass us, but not one of us can be possessed by him or his demons. No enemy against us can separate us from God (Rom 8:38-39), including Satan himself. The person who thinks a believer can be possessed has no Scriptural support for such an assertion. Many who professed to be Christian have come under demon possession, but this only shows that they had never truly received Christ as Savior and did not have the Spirit of God in them. Yes, we can be saved and face spiritual attacks. In fact, Paul said that there is an invisible enemy in high places of authority and/or power (Eph 6:12), so we’re not facing pea shooters, but we do have the armor of God to protect us from his fiery darts (Eph 6:13-18), however darts cannot kill us. Even Satan was restricted from taking Job’s life (Job 1:12). Maybe you’ve heard stories where an old house is haunted and there are ghosts there. The Bible doesn’t dispute that there are spirit beings, but these “familiar spirits” are not the souls of people who have died, and they are not of God, and if they are not from God, they can only be from one other place, and it’s not a good place (Satan, demons). When people claim to see ghosts or long lost relatives, what they are possibly seeing is a demon that is deceiving them into thinking it’s their long lost aunt, or their grandfather, or whoever else might have died. The Bible teaches that the dead face judgment after death, and it’s only appointed to die once in this life (Heb 9:27), so there is nothing in the Bible about coming back as a ghost. They are either appointed unto heaven or unto hell, and in the final judgment, not even Satan and his demons can escape (Rev 20:7-10), but neither can those who have all their lives rejected Christ (Rev 20:12-15), Who is the only means by which they can be saved (Acts 4:12). It makes no sense to have a demon possess an old grandfather’s clock (which I’ve heard of), or the old washing machine grandma used to use. There is no evidence in the Bible that demons can possess inanimate objects like cars, boats, houses, machines, or anything else that is not alive. Yes, they might be seen in such places, but they are not in these things. The person who God has brought to repentance and faith has nothing to fear at all, because they can say, “The LORD is on my side; I will not fear. What can man do to me” (Psalm 118:6), and “So we can confidently say, ‘The Lord is my helper; I will not fear; what can man do to me’” (Heb 13:6)? The only fear we must consider is the fear of the Lord, for there is true wisdom. Solomon records, “The fear of the LORD is the beginning of knowledge” (Prov 1:7a), and again, the psalmist declares, “The fear of the LORD is the beginning of wisdom; all those who practice it have a good understanding. His praise endures forever” (Psalm 111:10)! 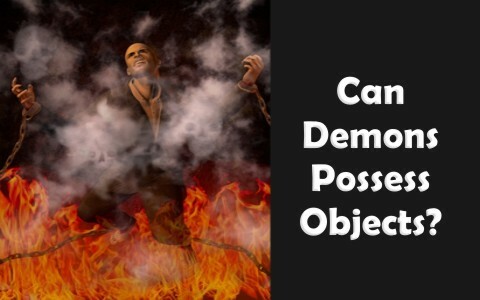 Here is some related reading: Can Christians Be Demon Possessed? Hi, Can you please assist us with the understanding of the scriptures in Rev.13:14-16, Dan.3:4-7 and Zech.5:5-11 as they relate to this question? Hello Crystal. Daniel speak specifically about King Nebuchadnezzar and Zech 5:5-11 is about a vision Zechariah had but I don’t see how they are interrelated. Can you tell me what you think of these three? I don’t seem them as being connected. Thank you Pastor Jack for bringing up such an important topic. I believe Crystal is inquiring about evil spirits seemingly attaching themselves to inanimate objects. An example in the occult is the ouija board often used in seances. In my opinion, evil spirits can be drawn to individuals(humans) who are practicing these activities and influence the outcome of the board, for example, but that does not mean the evil spirits “inhabit” the board(or necessarily the people involved). Then to your question Crystal. I believe the second beast in Rev 13 might be using a holographic image of the first beast through which he communicates to the inhabitants of the world. Crystal read vs 14 and 15 in the King James Version. It correctly interprets this as an image of the first beast(not a statue as other versions state). Haven’t you ever wondered how all the earth would “see” the image of the beast and be forced to worship? I believe it will be something like that, although that is just a guess. Remember in Acts(19:19) when all the books used in sorcery were brought and burned in the public square? The books were not possessed but had attracted evil spirits. I see your point. I will let Crystal know and I think you are right my friend. Thank you. PS. Thanks brother for being my friend and speaking the truth (Prov 20:30, 27:6, 28:23). Previous post: Why Did God Tell Moses He Would Kill Him?